The Ethiopian Air Force (ETAF); Amharic: የኢትዮጵያ አየር ሃይል, Ye Ithopya Ayer Hayl, is the air arm of the Ethiopian National Defense Forces and is tasked with protecting the air space, providing support to the ground forces as well as assisting during national emergencies. The origins of the Ethiopian Air Force has been traced to (then Ras) Haile Selassie witnessing a show of the British Royal Air Force in November 1922 in Aden. Having never seen an airplane before, he was captivated by this demonstration of their power and abilities, and spontaneously asked if he could go up in one of the biplanes, proclaiming that it was "very fitting that he, as regent of Abyssinia should be the first Abyssinian to take flight in an aeroplane." As a result of this experience, he afterwards advocated the development of the Imperial Ethiopian Air Force. This small air arm began with the delivery of a Potez 25-A2 to the capital Addis Ababa on 18 August 1929. The Ethiopian Air Force was organized by Mishka Babitchef, the first Ethiopian pilot, who was of Russian descent. A Junkers W 33c followed on 5 September. On 31 March 1930, three of the biplanes from Ethiopia's air arm played a dramatic role in a battle between Haile Selassie (not yet crowned Emperor) and conservative forces seeking his ouster. During the Battle of Anchem, biplanes were effectively used to give Haile Selassie's forces the upper hand. A few transport aircraft were also acquired during 1934-35 for ambulance work. The air force was commanded by Colonel John Robinson (African-American, took command May 1935), recruited by Haile Selassie, and who remained until the Italian conquest of Ethiopia, when the small air arm ceased to exist. 1 × Farman 192 c/n? 1 × Farman F.190 converted to F192 by engine change, c/n? 1 × Junkers W33c (acquired in 1929). 1 × Meindl van Nes A.VII Ethiopia 1. 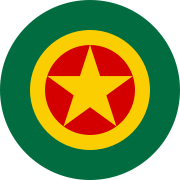 After the liberation of Ethiopia, the country started reorganizing the embryonic air force that had existed prior to the Italian invasion, commanded by Colonel John Robinson (African-American). In 1944, a group of World War II African-American veterans set up a flying school at Lideta airport in Addis Ababa. The nation acquired a few aircraft through military aid from the United States and United Kingdom; and the school had some 75 students by 1946. As neither the United States or United Kingdom was interested in providing assistance, Ethiopia turned to Sweden to help create a modern air arm (see Ethiopia–Sweden relations). The Swedes agreed to provide assistance and Carl Gustaf von Rosen was appointed as the chief instructor of the newly re-formed Imperial Ethiopian Air Force (IEAF). The Swedish contingent played a critical role in setting up a solid foundation. It sent Safir trainers and B-17A light bombers from Sweden, and the Ethiopian government acquired C-47 Skytrain transport aircraft from the United States to equip the flight training, bomber, and transport squadrons, respectively. In 1951, the IEAF formed its first fighter/attack squadron by acquiring Fairey Firefly fighters from the United Kingdom. 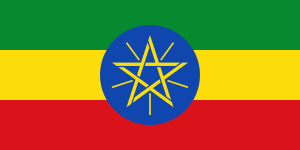 In 1953, a military agreement was entered between the United States and Ethiopia for a military assistance program (see Ethiopia–United States relations). Its aim was to provide Ethiopia with capable military force for defensive purposes. The US military sent a team to undertake a comprehensive study of the Ethiopian military capabilities, requirements and the probable threats facing Ethiopia. The IEAF benefited immensely from the program. The US Air Force sent a team of officers and NCOs led by a Colonel to assess the force and provide recommendations as part of the Military Advisory and Assistance Group undertaking the comprehensive study of the Ethiopian military. The IEAF was to be restructured organizationally and adopt US style operating procedures. Emphasis was given on building up IEAF's training institutions. Several Ethiopian personnel were sent to the US for training, including 25 Ethiopian pilots for jet training, and many more were trained locally by US Defense personnel. In 1957, the first three of several T-33A jet trainers were supplied followed by F-86F fighters in 1960. In 1961, T-28s were acquired for advanced training. This influx of equipment and training made the IEAF, in the opinion of historian Bahru Zewde, "the most prestigious show-piece of American aid in Ethiopia. It was also reputedly the most modern and efficient unit of the armed forces." In 1964, the Somalis began receiving large quantities of weaponry ground equipment and MiG-17 fighters from the Soviet Union (see Ethiopia–Russia relations). In response, the US started delivering the supersonic F-5A jet fighters in 1965 to counter this new threat. However, it was careful not to escalate the situation further. The US delivered the F-5As without providing a major weapon systems for the aircraft, the ability to use air-to-air missiles. Nevertheless, the delivery of F-5As had serious implications in the Horn of Africa because no neighboring country had anything similar to this new jet fighter. The Somalis were furious and described the F-5A transfer as a grave threat to the security of the Somali people and the rest of the Horn. In 1976, the US agreed to supply more advanced F-5Es along with AIM-9B sidewinder missiles after the Soviets delivered MiG-21 fighters to Somalia. 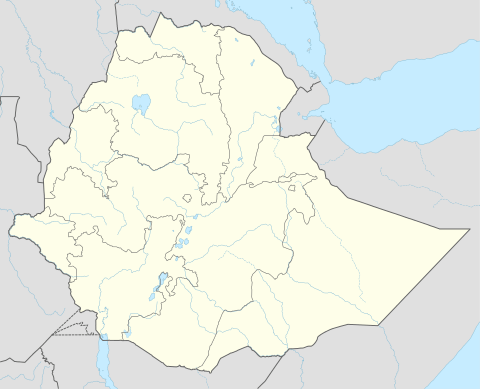 The F-5E aircraft destined for Ethiopia were never delivered and were stored at Williams AFB, Arizona during the Ogaden Conflict (Ethiopia - Somali War, 1977 through 1978). While the ETAF role was critical in stopping the advance of the Somali forces, the ground forces were not ready for offensive operations to expel the Somalis from the area they controlled. The army was short in equipment of all sorts, and after the Derg acquired power United States President Jimmy Carter cut off all military aid to Ethiopia. Desperate, the Derg regime turned to the Soviets for help. The Soviet Union, which was providing assistance to Somalia, switched sides and agreed to provide substantial economic and military aid that proved to be decisive. As a result, ETAF received large number of aircraft for fighter, helicopter, transport roles. The Cubans provided 17,000 troops to support the Ethiopian forces. Included were Cuban pilots who flew the newly Soviet supplied MiG-21s. In the 1980s, non-Soviet aircraft were also acquired. Several L-39C jets were acquired from Czechoslovakia for jet transition training. In addition, SF-260TP trainers were acquired from Italy in two batches to replace the aging Safirs, and two L-100 Hercules transport aircraft, the civilian version of the military C-130 Hercules transport, were acquired through Ethiopian Airlines (see Czechoslovakia-Ethiopia relations, Ethiopia-Italy relations). While its performance during the war with Somalia saved ETAF from the purges inflicted on the army and nearly every other institution in the country, the Derg was determined to keep a close eye on it. To increase its control, the Derg created a three-man committee constituting the force commander, political commissar and representative from the security service to oversee the air force. In addition, adhering to the Soviet advice, the ETAF's organization was replaced by a Soviet-style regimental structure. The Soviet influence had major impact on ETAF. The Soviets offered to train all pilots at a joint training center for all their satellite states leaving ETAF responsible only for operational training. They also offered to train engineers at their own schools. Expecting to realize enormous cost savings, ETAF accepted the offer. As a result, both the flying school and Air Academy were closed in 1980 and all recruits were sent to the Soviet Union after passing aptitude test examination and medical screening. Dissatisfied with the Soviet provided training, ETAF re-activated both its flight training school and Air Academy in 1984. SF260TP propeller aircraft for primary screening and L-39 jets for jet-transition training were acquired from Italy and Czechoslovakia respectively. The Air Academy was reopened using civilian instructors with degree programs in aeronautical engineering, aeronautical administration, and electrical engineering. The period witnessed the declining of ETAF's maintenance and engineering centers. Unlike the Americans, the Soviets were unwilling to transfer technical know how. They insisted that every major repair work be undertaken by them in the Soviet Union. In addition to the logistical nightmare, the cost was prohibitive for the air force already financially stretched supporting the ground forces in the raging civil war. The Soviets relented and agreed to set up a depot level maintenance, repair and overhaul center after the Derg regime took up the matter with the Soviet leadership. However, lack of finance hindered the progress and only minimal work was done by 1991. The project was restarted in 1995 and formally inaugurated in 2004. The Derg years saw ETAF embroiled in the civil war. The ETAF played a critical role in the Derg's war effort in the north. It was the main stumbling block the rebels faced from achieving total victory. However, in the late 1980s, many in Air Force began questioning the prosecution of the war. Following the failed coup of 1989, in which the ETAF's top leaders participated, its high command was decimated with arrests and executions. As a result, ETAF was suffering from low morale and serious internal rifts. Pilots were defecting in increasing numbers to neighboring countries. The situation on the ground was also becoming hopeless. Eventually, the forces of the Ethiopian People's Revolutionary Democratic Front (EPRDF) overran the Derg’s army and took control of the country in 1991. The change of events that followed had tremendous impact on ETAF. In 1991, the Soviet backed Derg regime was deposed by EPRDF rebel forces. EPRDF ordered all members of the military, including those of ETAF, to report to detention camps set up throughout the country. EPRDF started reorganizing the air force soon after taking power. Shortly after taking complete control of the country, it selected about 50 officers and NCOs from the rehabilitation camps to reactivate a transport wing. In addition, more pilots and ground crew were returned to bring back the assets that were flown to neighboring countries by fleeing pilots in the final days of the Derg. The EPRDF government was cognizant of the critical role of air power, having experienced it first hand during its long war with Derg. It set up a new high command which included senior EPRDF military commanders and former members of ETAF who have previously joined EPRDF. Its primary task was to restore ETAF to operational status. In August 1992, the flying school was reopened and training of cadets was resumed. As a result, many of the instructor pilots under the Derg regime were allowed to return. In addition, senior EPRDF commanders assigned to the high command were sent abroad for staff training. The first batch of pilot trainees graduated in June 1995 which continued yearly afterwards. However, the early period was fraught with much friction and mistrust between the retained personnel from the former Derg regime and the EPRDF military commanders assigned to ETAF. In 1995, the EPRDF government unveiled a plan for a new Ethiopian National Defense Force. The plan called for a smaller air force with streamlined organizational structure and fewer bases. As a medium term solution, ETAF's air and ground assets were to be upgraded with modern systems and completion of the maintenance and overhaul centers started under the Derg. However, lack of finance delayed the implementation of most projects. The political leadership felt there was no threat to speak of facing the country to justify large expenditures, particularly pertaining to the extensive (and expensive) upgrade project for the MIG-21/23 fighter fleet. The unexpected outbreak of war with Eritrea in June 1998 led to a significant change in ETAF. The entire Ethiopian National Defense Force was ill prepared for the conflict. Most of Ethiopia’s ground forces were located in south and southeast. The EPRDF government considered the northern borders to be the most secure due to its then close relationship with Eritrea and had decided to leave the border security in the hands of the local militia and police forces. The case with ETAF was no different which never had replaced its northern command base it lost when Eritrea seceded. In the two years that followed from 1998–2000 and despite the many constraints, ETAF’s was able to provide crucial support to the ground forces. Su-27 air superiority fighters were acquired along with advanced versions of the Mi-35 helicopter gunships. The Su-27s were used to shoot down two Eritrean Air Force MIG-29s; the first on Feb. 25, 1999 and the second on Feb. 26, 1999. In return Eritrean MiG-29s shot down a total of five MiG-21 and three MiG-23 fighters during the war. Lessons learned from the war were incorporated throughout which increased the effectiveness of the ETAF in second year of the war. Su-25T jets with precision strike capability were acquired along with sophisticated electronic warfare systems. Its members undertook dangerous missions deep inside Eritrean territory from interdicting supply lines, reconnaissance and destruction of air defense. After the war, ETAF was reorganized to better prepare it for future conflicts based on lessons learned during the 1998-2000 war. Changes were made to better reflect in its doctrine the effects of the newer equipments acquired ability to deploy precision guided munitions. The long running maintenance and overhaul center project, DAVEC, was also sped up and inaugurated in 2004. After its independence in 1960, Somalia started making claims to all territories that were largely occupied by ethnic Somalis in neighboring Djibouti, Ethiopia and Kenya. However, majority of the land claimed was in Ethiopia which made it Somalia's main target. After failing to get support within the Organization of African Unity, Somalia declared war on Ethiopia in 1964. The Somali forces launched their attack at Togochale, a border town east of Jijiga, but the Ethiopians were no match to the comparatively well-equipped air forces of Somalia. The brief conflict provided the IEAF with valuable experience. Lessons learned included the need for heavy bombers, an air defense complex, secure and reliable communication system, and better coordination with ground forces. As a result, Canberra bombers and air defense radars were acquired from Great Britain and the US respectively. In 1974, a popular unrest against Emperor Haile Selassie led to a military coup. The military then formed a committee from within, known as the Derg, dominated by junior officers and NCOs. Shortly after, it executed 60 top civilian and military officials and imprisoned many others. In addition, the Derg forced out many career military officers it was suspicious of. The army was in shambles and the country was engulfed in a political turmoil. It was during this moment the Somalis launched a massive invasion in 1977. Already alarmed at the increasing noise the Somalis were making, the Derg government had managed to convince the Ford administration to provide Ethiopia with F-5Es. The first batch of six pilots were sent to Williams Air Force Base in Arizona for conversion and tactical fighter training in August 1976. However, further training of pilots and delivery of aircraft was stopped after President Carter cut off all arms supplies in protest of the Derg's human rights violations. Using the eight F-5Es as interceptors, F-5As for close air support and Canberra for heavy bombing, the ETAF overwhelmed the Somali Air Force. Throughout the war, it also conducted strikes against several targets deep inside Somalia, including the repeated bombings of the Somali Air Force's northern main operating base at Hargeisa and long range attack on the Berbera. The ETAF lost three F-5Es to ground fire and one C-47 transport plane to a MIG-17 while one Canberra was flown by a defecting pilot to Somalia. Another Canberra was lost due a mechanical problem deep inside Ethiopia after it suffered hits from ground attack. Two F-5E pilots as well as the C-47 crew were captured by the Somalis while one F-5E pilot was rescued by helicopter. One of the F-5E pilots captured was Legesse Teferra, credited with six Somali MIG kills. His F-5E was shot down while overflying an area thought to be in control by Ethiopian forces. He was captured by the local Somali population and was turned over to then Somali army commander of the region, Colonel Abdullahi Yusuf. Colonel Abdullahi Yusuf later became President of Somalia. The other captured F-5E pilot, Afework Kidanu, died while in captivity in Somalia. In addition to the Air Force inventory, the Army operates 2 DHC-6 transports and 5 Bell 205 helicopters. ↑ "Carter in Ethiopia: Revisiting one of the Nobelist's missed chances"
1 2 3 4 5 6 7 8 9 10 11 "World Air Forces 2015 pg. 15". Flightglobal Insight. 2015. Retrieved 7 June 2015. ↑ "World Air Forces 1987 pg. 52". flightglobal.com. Retrieved 7 June 2015. Gordon, Yefim and Alan Dawes. Sukhoi Su-25 Frogfoot: Close Air Support Aircraft. London: Airlife, 2004. ISBN 1-84037-353-9.
Cooper, Tom; Weinert, Peter (2010). African MiGs: Volume I: Angola to Ivory Coast. Harpia Publishing LLC. ISBN 978-0-9825539-5-4.